This exhibition sees the coming together of two museums and of the work of two enormously influential British photographers. The Media Space at London’s Science Museum is a brand new gallery built to showcase highlights from the National Photography Archive, held by the National Media Museum in Bradford (part of the Science Museum Group). The Media Space’s inaugural exhibition, Only In England, brings together the work of Martin Parr, one of the leading lights of British photography since the 1970s, and Tony Ray-Jones, another British photography pioneer whom Parr has cited as his biggest influence. Their photographs are a study of the English and their way of life; of their customs, quirks and sensibilities. And it is the beautiful and often strange mixture of humour and sadness that permeates these images – with a bit of surrealism thrown in too – that makes this such a captivating collection. There are three parts to the exhibition. 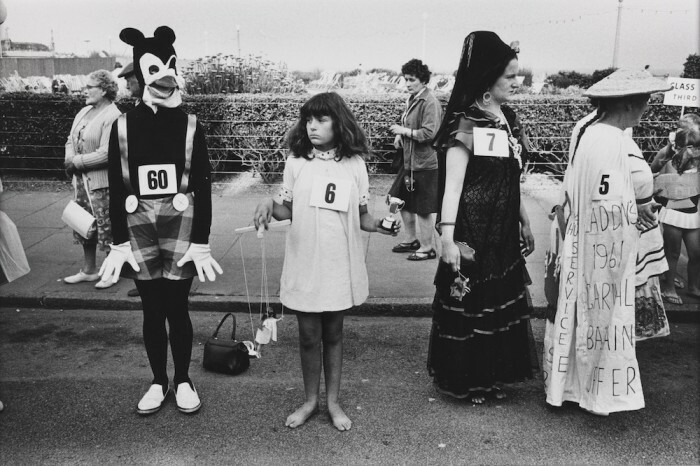 First comes Tony Ray-Jones’s work from the late 1960s documenting the English in their leisure time, made famous by the book A Day Off published in 1974, two years after his untimely death from leukaemia aged only 30. 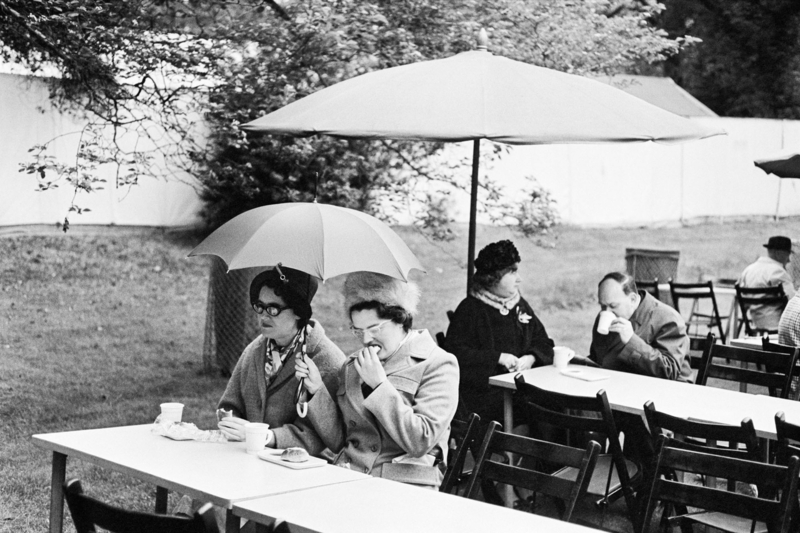 Then we have The Non-Conformists, a collection of photographs taken by Martin Parr not long after A Day Off‘s publication, in much the same style. The third section of the exhibition comprises another set of Ray-Jones’s images of the English from the 1960s, this time hand-picked by Parr from the National Media Museum’s extensive archive of his original negatives and contact sheets. It is as close as these two photographers, whose careers overlapped but who never met one another – have ever got to a collaboration, and more than forty years after Ray-Jones’s death, it is the first time that these fifty-five new prints have ever been seen by the public. At a time when photography was taught purely as a technical subject in the universities and polytechnics of Britain, it was in America that Tony Ray-Jones first learned his trade, studying at Yale School of Art before working in the studio of the legendary Richard Avedon in New York. He become friends with many of the city’s leading street photographers, such as Joel Meyerowitz and Garry Winogrand, and was fascinated by the spontaneous, candid aspect of their work, a style as yet relatively unseen in Ray-Jones’s native Britain. When he returned home in 1965, Ray-Jones eagerly set about photographing English subjects in this documentary, street-photographer style, using high-contrast black and white 35mm film. In between what became an enormous project that would take him more than three years, and see him travel the length and breadth of the country, Ray-Jones was a reluctant commercial photographer, working for numerous magazines and newspapers to earn his living. At a time of sweeping social change, Ray-Jones was especially interested in what he saw as a gradual Americanisation of English culture, and was keen to record anything that he saw as been particularly – or peculiarly – English before it vanished forever. The many books that he read on his travels, and the many pages of notes he carried with him – some of which can be seen in the exhibition – demonstrate his fascination with the English psyche, English manners and English personality traits. Which is why anyone who shares this fascination, such as myself, will find so many of these images so funny. The seaside towns (more often than not on grey, blustery days) feature prominently, as do traditional social gatherings like fetes and carnivals. It seems that even when Ray-Jones’s subjects are holidaying, relaxing or generally unwinding, the classic English reserve and stiff upper lip manages to hold firm. I was intrigued to hear of Tony Ray-Jones’s photo-taking techniques from curator Greg Hobson. The key to creating documentary-style, candid images was to get close to the subject without thinking they were having their picture taken, ensuring they did not look into the camera. In fact, part of what makes his photographs so distinctive is how the subjects appear to be peering into the middle distance, in an almost longing, hopeful fashion, giving the images their underlying sense of melancholy. As it turns out, Ray-Jones’s preferred technique was to carry two cameras (both Leica rangefinders, one a 35mm lens and the other a 50mm). One he would hold at eye level, pointing it at something in the distance – so that any chosen subject who noticed him standing near them would either ignore him completely or turn to look at what he was pretending to photograph. The other he would hold at waist level, that would actually take the photo. The fact that he was able to shoot as spontaneously as he did, and capture fleeting moments precisely as they happened, makes Tony Ray-Jones’s composition seem all the more masterful. He frames groups of subjects together in odd, intriguing ways, so as to make pictures busy, alive with activity and motion, and full of little details that you only notice with a second or third look. I especially enjoyed the way he groups together people who are clearly not aware of one another at the moment the picture was taken, each looking off into different directions, often making for interesting contrasts. Someone still and someone moving, someone blank-faced and someone excited, or someone old and someone young. With this being the 1960s, after all, the way younger people and older people dress and behave makes for a particularly striking contrast. 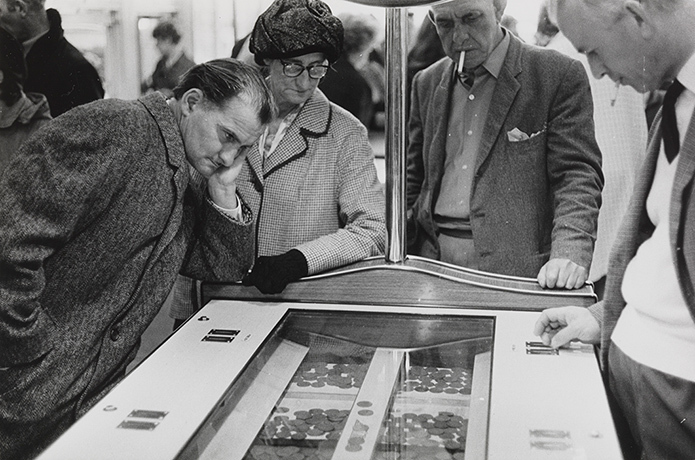 Unlike Tony Ray-Jones, whose non-commercial work was only beginning to get recognised when he died in 1972, Martin Parr has enjoyed a long and successful career, both commercial and non-commercial, shooting all manner of subjects in an array of different styles and using different media. But in his first major body of work, the Non-Conformists, the influence of Tony Ray-Jones is clear. While the subject matter is far more specific than Ray Jones’s – a small Methodist chapel and the daily lives of its congregation, as opposed to the whole country – there is a shared theme of trying to document a disappearing way of life. Hebden Bridge, where Parr lived for several years after graduating from Manchester Polytechnic, was a traditional mill town in a North Yorkshire valley, a small community where everybody knew each other. At its heart was a tiny church, once the social heart of the town, but with a regular congregation of just nine people by that time, most of them farmers whose families had worked on the surrounding land for generations. No doubt its inhabitants, made up of mill-workers, shopkeepers and sheep farmers, would have seemed old-fashioned to many even forty years ago. Seeing these photographs on display today – in a central rectangular room of the exhibition, mimicking the interior of the chapel – only serves to add to their poignancy. And like Ray-Jones’s images, they are full of warmth and humour, of colourful characters, and could only have been taken in England. Stay with the subject matter (be patient). Only In England runs at the Media Space at The Science Museum until 16 March 2014. Tickets are £8 for adults and £5 for concessions and can be bought here, while a short video all about the exhibition can be seen here. POSTSCRIPT (31st March 2014): Only In England will now be running at the National Media Museum in Bradford until 29th June 2014. Entry is FREE. Tags: 35mm, A Day Off, America, Americanisation, black and white, Britain, camera, culture, English, exhibition reviews london, exhibitions london, Garry Winogrand, Hebden Bridge, Joel Meyerowitz, Leica, Manchester Polytechnic, Martin Parr, media space, melancholy, methodist, National Media Museum, only in England, only in England review, photograph, Richard Avedon, science museum, seaside, street photography, surreal, the Non-Conformists, Tony Ray-Jones, Yale School of Art. Bookmark the permalink.